In Roman times, the territory of Montenegro was known as Doclea or Duklja. With the arrival of the Slovenes in the 7th century, Christianity quickly gained importance. The first Prince of Duklja, which included the area of Skadar Lake was Vladimir. Duklja achieved independence in 1040, and was proclaimed a Kingdom in 1077, becoming one of the first independent states in the Balkans. It was named Zeta, which in the old Slavic languages meant the harvesters. Byzantium gained dominance over Zeta. The great Serb ruler Stefan Nemanja, , later known as Saint Simeon, took control of Doclea in 1185, but allowed it to retain its status as an independent state, Montenegro came into existence as an independent state in 1355, following the break-up (or down) of the Serb Empire. The name "Crna Gora" (Black Mountain or Montenegro) is mentioned for the first time in the Charter of King Milutin, in 1276. It undoubtedly got its name from the dark dense forests on and around Mount Lovcen. The use of the name Montenegro began in the 15th century when the Crnojevic dynasty began to rule the Serbian principality of Zeta. Over subsequent centuries it was able to maintain its independence from the Ottoman Empire. From the 16th to 19th centuries, Montenegro became a theocratic state ruled by a series of bishop princes. In 1852 it was transformed into a secular principality. After World War I, Montenegro was part of the Kingdom of Yugoslavia, and, at the conclusion of World War II, it became a constituent republic of the Socialist Federal Republic of Montenegro. When the latter dissolved in 1992, Montenegro federated with Serbia, first as the Federal Republic of Yugoslavia and, after 2003, in a looser union of Serbia and Montenegro. Following a three-year postponement, Montenegro held an independence referendum in the spring of 2006 under rules set by the EU. The vote for severing ties with Serbia exceeded the 55% threshold, allowing Montenegro to formally declare its independence on 3 June 2006. 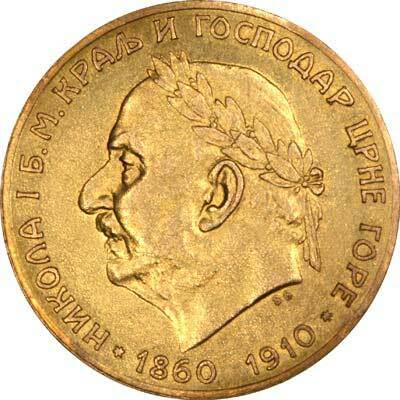 Montenegrin gold coins are denominated in lei, which is the plural of leu. 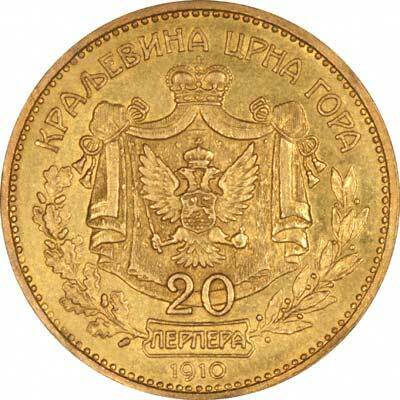 We give below the specifications of most of the more frequently encountered Montenegrin gold coins, followed by a stock list of any we have for sale. Diameter = diameter in millimetres. Weight = gross weight in grams. Gold Content = actual fine gold content in troy ounces. Coat-of-arms consisting of crowned double headed eagle holding an orb and sceptre, on ornate crowned drapes. Superimposed on the bottom of the drapes are the figures 20, beneath which the word Perpera in a panel or escutcheon, with the date 1910 below. From the escutcheon, an oak and a laurel branch emanate to the left and right respectively. For silver and base metal coins of Montenegro, please look at our original Chard Coins website.